On November 2005, Venezuela ordered from Navantia, the construction of 8 patrol boats, 4 BVL for the control of the coast, and 4 POVZEE, for the control of the exclusive economic area. The missions of these ships are basically the vigilance and protection of the fishing zones, protection against drugs enforcement and anti-smuggling operations, and protection of the maritime traffic. 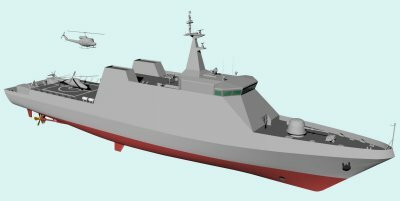 As part of this contract, Navantia is also building 4 patrols for the control and protection of the exclusive economic area, to be delivered from May 2010 to July 2011. Besides the important work for the shipyards of Navantia until 2.012, this contract means an important commercial milestone for the company, as it outlines its position in this market, with an own last generation project. The ocean patrol surveillance can play various missions such as surveillance and protection of the exclusive economic zone, protection of maritime traffic, defense of strategic interests, search and rescue operations, relief units and humanitarian, marine pollution control, prosecution of smuggling, drug trafficking and illegal immigration, surveillance and obtaining information from operational or environmental intelligence, defense, surface and passive electronic warfare. The design of the patrol Ocean Surveillance of the Exclusive Economic Zone (POVZEE), constructed by Navantia for the Venezuelan Navy, incorporates two elements unusual in the hull of patrol vessels: the bulbous bow and a wedge in the stern. The bulb is an array of engineering that has as main objectives: to improve the hydrodynamic profile, established in reserve buoyancy, and improve the ratio length / beam (the latter in turn associated with the speed). Its job is unusual on ships patrolling because it tends to simplify the construction, and because the factor of speed (often the most important), is easily corrected with more engine power, which means at the design changes simple without any major impact on design and engineering. The stern wedge is a slight discontinuity at the end of the hull that allows a reverse curl down in the stern very close to the mirror.This curvature is intended to boost slightly the water down a pair of power generating opposed to lifting the bow to increase speed. The use of this tends to be specifically indicated for semi-displacement ships. The combination of these elements has the effect of "dynamic trim," which is to maintain the ship with the best hydrodynamic profile in the moments in which uses more power, coupled with the decline in the apparent dip of the mirror and maintenance of the bulb next to the surface without coming off the water. To understand the effect one can imagine intuitively the effect of lifting the bow to increase the speed, as well wedge in turn tends to push water and slightly down by the effect of action and reaction to raise the stern. Given the characteristics of the ship, the latter opposes lifting the pair of forces from the bow so that maintaining the trim of the ship and the best profile of progress. Tests were conducted on various angles of inclination proving 14 degrees the most appropriate, which in trials presented very favorable results from 16 knots. Reaching the threshold of 24 knots (maximum speed of these vessels under contract), the power required by the propellers are reduced by 4% (very notable), which is an indirect indication of a very mild the design and decreasing the chance of cavitation, vibration and noise radiated. The Guaiqueri patrol ship of the Navy of Venezuela set sail on 02 May 2011 from the port of Cadiz in Spain, the first of the four type "Oceanic surveillance". The Spanish shipyard Navantia delivered the ship on April 14 to the national Bolivarian Armada (ANB). On 07/12/2011 Shipyard San Fernando-Puerto Real of Navantia delivered POV "Yekuana", the third of the four ocean surveillance patrol ordered by Venezuela. The event was attended by the General Commander of the Navy of the Republic Bolivariana of Venezuela, the Naval Commander of the logistics of that country and Navantia de Delegado Adviser, among others. On 23 April 2012, Navantia comissioned to the Venezuelan Navy the fourth Economic Zone Patrol Boat (PVOZEE), named ““Kariña” (PC-24). The ceremony was attended by the Venezuelan Ambassador to Spain, representatives of the Venezuelan and Spanish Navies, as well as other military and civil authorities. This ship is the fourth of a series of four that Navantia has built for the Venezuelan Navy. Its keel was laid in February 2010 and its launching took place in July same year. Fuel autonomy 3500 nm @ 15 kn.